The news of a pregnancy is a blessing to a young couple; their love is made real. It will soon be solid living screaming pooping flesh that will occasionally fall asleep sometime. What a blissful time of life, when two loving people come together, give up the last traces of their youth, and become a family of three. Gone are the hollow, unsatisfying nights full of peace and quiet. The freedom to come and go as one pleases are in the past, replaced by the comforting shackles of never being able to shirk certain kinds of responsibility ever again. Say goodbye to old friends, you won’t need them anymore. You won’t ever find time for them again anyway. With a new baby comes a new, better life, and certainty of a kind of “immortality” as your DNA is passed along to another generation. 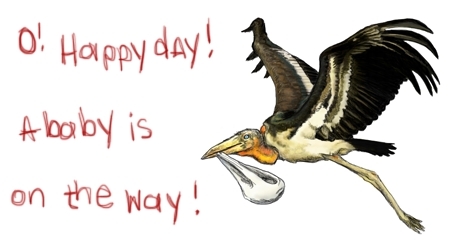 Announcements must be made, plans put into motion before the Big Day arrives and the Stork comes along to bestow upon you the new focal point of your daily existence. What would I know about any of this? What business have I, a cold and twisted harpy who shudders at the thought of being depended upon, of having serious responsibilities, of having to nurture another living thing — what business is it of mine to even dare breathe a single word about parenthood or raising kids? I have never had a fetus in this old womb, sucking away my will to live, my very physical life force becoming dimmer with each passing moment, but oh yeah, that physical essence is getting replaced by some sort of “spiritual strength” or something. Because a woman can’t be complete until she has answered the call of Nature. When the Clock calls up her brain and shouts TICK TOCK TICK TOCK until she breaks down and becomes fertilized, if she can. Well, it’s true. I have very little idea about anything about babies and procreation. My first paragraph was based on greeting cards I have read and movies I have accidentally seen a little of before I realized it was so pro-baby. But that’s okay because I DO know about storks!! As you all know, babies can either be found under the leaf of a cabbage or they are delivered via stork. Most rural babies are the cabbage ones, and storks, being birds who tolerate human settlements very well, usually take care of the urban babies. Expectant parents excitedly make their preparations, keeping an eye to the sky and setting out pikes with frogs and fish stuck to the ends, hoping to attract the blessing of a kindly stork. What I have discovered that many people DON’T know, however, is that there isn’t just one sort of stork doing this business. If you look up kinds of storks, there is not one called Dr. 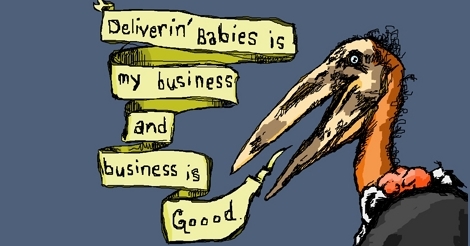 Delivery Stork, OB/GYN. No! The fact of the matter is that there are many different storks and they all deliver babies to lucky couples, and some singles as well. 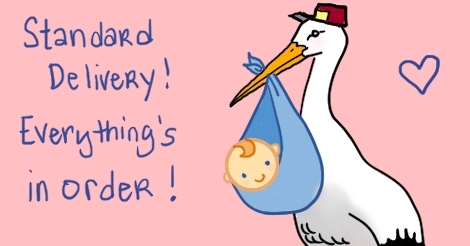 When you look up at the sky and observe a stork with a blessed bundle in its beak, you can tell the sort of baby that is being transported based on what sort of stork is delivering. This here is a handy guide to help you, in case you see a stork headed your way. If it is not a stork you like, try your best to hide, or perhaps ward it off with a bb gun. For those of you uninterested in having a family, the guide will allow you to keep up with the goings-on of your neighbors. We all like to gossip like that, it’s okay. So here follows the six main storks you will be sure to see doing the most work. There are a few I left out primarily because the storks who look a lot alike tend to mingle in the same delivery rooms in Heaven and therefore deliver the same sorts of babies. A fairly large sort of stork, it is easily recognized for being mainly white with some black on its wings. They have something like a six to seven foot wing span and can carry as many as a set of triplets in its beak, although this is very uncommon. You will mostly see White Storks, for they are the most active coming from the big delivery room in the sky. White Storks were made famous by being the ones depicted on greeting cards and in cartoons. It delivers totally normal babies destined for anonymity and average living. The babies will develop normally, they will not be outstanding toddlers, and they will never achieve fantastic fame or notoriety. This is not to say that the babies will never know success! No, many people who run moderately successful, boring businesses were delivered by White Storks. They are frequently content with life and people like them, and forget them easily. Most people are White Stork Babies. These Malaysian-born storks are quite distinctive in that they are gleaming white with green-black tail and flight feathers, pink faces and big yellow beaks. They closely resemble the Painted Storks, but neither type is seen very often, thankfully. This is a very rare sort of stork with a dwindling population. Science reports blame a loss of habitat, but in fact the trouble is that these are considered bad luck and are trapped and killed by humans – the reasons become clear by the end of this paragraph. Their collective track record of delivering babies successfully is woefully low. They frequently get lost, set the bundles down and then forget to get them to their destinations, and all sorts of other rookie errors. If you see a Milky Stork flying in slow confused circles above your city, you may grow solemn because you are probably seeing what turns out to be a miscarriage — or if it does get to the parents in time — it will likely be the victim of crib death or something dreadful like that. Milky Storks suffer from Unemployment owing to the fact that infant mortality rates are dropping around the world. Unfortunately for them, stork society is not well organized, so those who cannot find work are left in the streets and often starve to death. Which is probably exactly what they deserve. This enormous, stately bird is very flashy and noticeable. It is mostly spotted flying in the sub-Saharan African continent, delivering future kings and other people of importance. 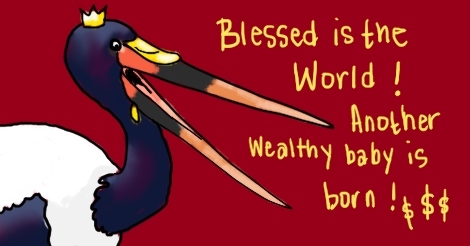 This stork is as big as a small man, but has a much larger wingspan. Its plumage is gorgeous, and there are some tribes who still wear its feathers as fashion, hoping to attract the storks to their homes, gifting them with the wealth and power associated with Very Important Babies. 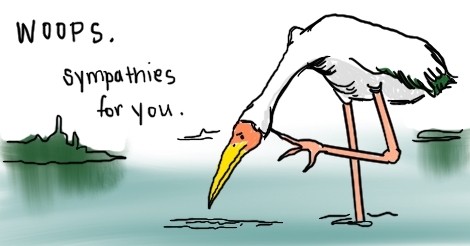 The storks are not easily fooled, however. In the past, these birds were seen all over the world, circling castles and palaces, looking for an opulent place to land. There was a confusing time in their natural history, while the monarchies were crumbling and revolutions were raging. They are adaptable creatures, you’ll be pleased to know, and now they deliver quite happily to the rich elite, oligarchs, and any family that desires to take the path of nepotism in all its many golden-flecked forms. The rarest of all storks, this modestly sized beauty is occasionally seen here and there. It is known to bring brilliant artists, dancers, and geniuses to their appointed homes, to begin their lives for good or bad. Obviously, it is not necessarily going to bestow that house with fame or wealth, so don’t bother getting in good with the family for future gains. Many creatives are troubled, so do take that into account as you shamelessly whisper to friends and neighbors about spotting this stork. This three foot tall bird is very easy to spot, by the way. It makes itself known at delivery time with an elaborate, interpretive dance. Sometimes, other Storm’s Storks accompany the delivery in order to perform a choreographed spectacle. They want to draw a crowd, so be sure to gather around them and applaud enthusiastically. The baby being handed over is going to be a bright and shining star some day, even if no one sees the evidence until after they have passed of old age. A massive bird standing over five feet tall and weighing up to twenty pounds, and flying at about eleven feet wide, this stork grabs the attention of anyone searching the skies for babies. Unlike most storks, the Marabou flies with its neck retracted, like a heron, and its gular sac can be used to carry babies that are underweight and frail. Many shudder at the sight of this bearer of infants due to its grotesque appearance and ghoulish neck ruff. This is fair, but what is unfair is that this unease extends to the babies it has brought into the world. 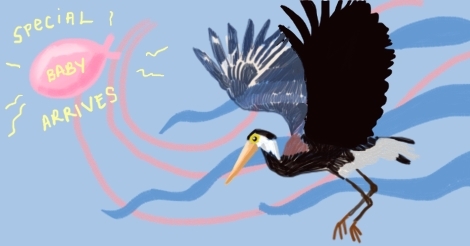 The Marabou Stork, along with its somewhat similar brethren the Greater and Lesser Adjutants, delivers tiny humans destined to be weirdos, goths, and the depressed, to name but a few. The sorrowfully maladjusted are packed in that neck sac, or at least delivered via regular sack and that long, sort of sparsely-haired bald head. These storks can be found in the Heavenly Delivery Room that is cushioned in grey rain clouds. When they take off, they emit a heart-breaking groan that sticks inside of the baby’s soul forevermore. Have you ever seen a Shoebill Stork? I hope not, for if you have, it means you have watched a dark portent unfold. The Shoebill is a stork-like bird in much the same way as the tiny little psychopaths it delivers are human-like humans. It stands tall, wades, and delivers babies — but look into its eyes. What is there is broken, or at least it is different, possibly primeval. It exists without kindness or love, and has been known to feed on the babies instead of delivering them. What a relief! 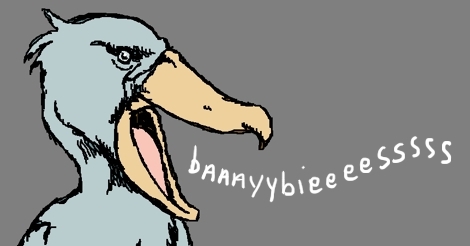 Babies brought by the Shoebill often grow to be nasty, unpleasant children who bully others. Often, they are unable to be reformed and turn into career criminals and killers. Some are intelligent enough to get away with their ill deeds and conduct unscrupulous business deals and excel in the world of politics. If they survive for a full lifetime, they negatively impact untold amounts of lives. It is the only bird that it is okay to throw rocks at in a primitive sort of panic.